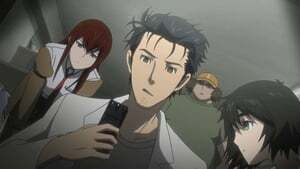 Rintarō agrees to let Kurisu look at the mobile microwave on the condition she become a lab member. They discover that Hashida was using the microwave at the time Rintarō sent his text about Kurisu’s stabbing. Despite the microwave causing a large electrical discharge when Mayuri opens it in the middle of operating, Rintarō concludes that the mobile microwave is, in fact, a time machine. After hearing about the large hadron collider and micro-black-holes, Rintarō asks Hashida to hack into CERN’s network. There, they discover they had already been performing micro-black-hole experiments, kept hidden from the public, which reveals that humans had died during them.